‘Not Dead, But Sleeping’ proclaims a late 19th-century stone in the Valley Cemetery. If gentle slumber in expectation of the Ultimate Alarm Call of the Last Trump on Judgement Day was hoped for, then the poor soul buried there was destined for disappointment. Peace was in seriously short supply in environs of the Holy Rude and its graveyards. The area surrounding the church has almost certainly been used for burials since at least the 1129 when Dominican monks from Dunfermline Abbey were chartered to build a chapel here by King David II. 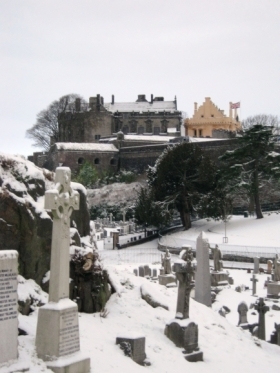 Nothing of this first church remains: it was damaged during a fire in 1406 and completely destroyed in 1452, decimated – like much of the Burgh – by the Clan Douglas, seeking revenge for the murder of William, Earl of Douglas, by James II at Stirling Castle. The foundations for a new stone tower were in place by 1455 – just in time to be razed, again, by the Douglases. In 1561 the fiery Protestant preacher John Knox visited, and led the congregation in tearing statues of the Saints from plinths on the outside of the kirk and smashing them on the ground – thus stripping the building of the last trappings of its Catholic past. More damage occurred, a few years later, in September 1571, when the Catholic Earl of Huntly led mercenaries on a night-raid of the Old Town, intent on kidnapping young King James VI and forcing Elizabeth I to release his mother – Mary, Queen of Scots – from her English prison. Huntly’s men were forced to cower behind the tower of the church from Musketeers commanded by the Earl of Mar, firing on them from his uncompleted new home, Mar’s Wark. Cromwell’s forces did likewise during their assault in August 1650 - the church tower extensively pock-marks by musket-shot from the Castle during this conflict, as are many of the older named monuments – including the Service Stone, raised in memory of his parents by stonemason John Service in 1636. Further blood and thunder ensued in January 1746 during the disastrous attempt by Bonnie Prince Charlie – Prince Charles Edward Stuart - to reclaim the ancient seat of his forefathers, during the second Jacobite Rebellion. He failed – positioning his siege guns on the lower ground of the Gowan Hill on one side of the Castle, and on the roof of Mar’s Wark (the Burgh Workhouse by this time) on the other, vulnerable to Redcoat artillery. The ruination of Mar’s Wark is largely due to Charlie’s defeat. The Valley between the Castle and Holy Rude, was landscaped by evangelist and seed-merchant William Drummond in the 1840s – creating a graveyard according to Biblical design - Isaiah 40:4 ‘Make straight in the desert a highway. The crooked shall be made straight and the rough places plain’ – ordered symmetry in an ordered cemetery – had it’s own turbulent past. It was also a place of public celebration, hosting travelling fairs and entertainments from the 17th-to-mid-19th-centuries: going ‘to see the fools in the valley’ was a regular weekend activity for rich and poor alike – witnessing performances by the likes of ‘Hawkie The Gangrel’, a hunchbacked balladeer. 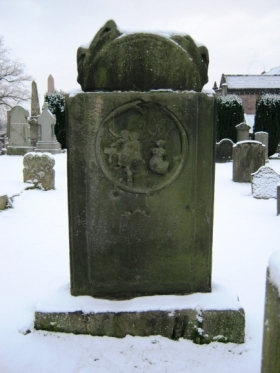 The grave markers of the Holy Rude speak volumes about how the people of Stirling viewed themselves. In the Valley and Mars Wark areas there are a number of rusted iron monuments – a reminder of investments by the respectable classes in the profitable Carron Iron Works, during the last flowering of the Mercant Burgh in the early 19th-centuries. The Apollonian obelisks and shrouded reliquaries reflect the prosperous middle-classes’ fascination with the Classical world. 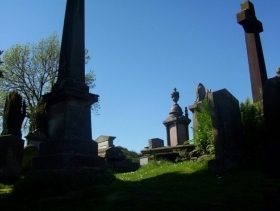 It is in the Auld Kirkyard, in the immediate proximity of the church – between the bell-tower and the rocky promontory of the Ladies’ Hill – that the most fascinating insights into the Burgh’s past can be found. Here you will find all manner of curious signs and sigils. 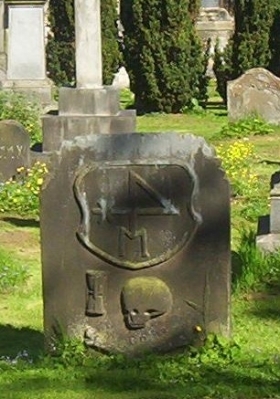 Death’s Head, the Skull and Crossed-Bones, the Winged Hourglass (time flies), and images of the Reaper reinforce the oft-inscribed Latin motto ‘Memento mori’ – ‘Remember, you too will die’. We see these as grim or ghoulish, but their meaning was quite the opposite – an acknowledgement that whether we be rich or poor Death will come for us all, and we should be sure to enjoy life while we can. Some will show signs of Divinity, reflecting hopes for whatever fate may befall us in Heaven or Hell. Many stones feature a trumpet, heralding the Last Trump on Judgement Day. Others – including the Service Stone, mentioned earlier, feature the peculiar image of a snake coiled in a circle swallowing its own tail, the Ouroboros: an ancient symbol of eternity, borrowed by early Christians as an avatar of Life, Death and Resurrection. Others show an even more peculiar pug-faced figure with leaves growing from his mouth. This is the Green Man or Wudwusa – the Celtic cousin of the Norse God Odin, who would sacrifice himself on Ygdrasil the ‘World Tree’ each Winter Solstice in order that – after 12 days of feasting drinking and fornication in his honour – his divine blood would cause the grass to grow through the winter frost, and the hourse of daylight increase (we still celebrate these practices, today – Ygdrasil being the inspiration for the Christmas Tree and Odin’s festival becoming Yule, the ’12 Days of Christmas’). Why is a pagan God featured in a Christian graceyard? Partly because his festival was incredibly popular – Christmas was moved on the calendar partly to win over our pagan ancestors – and partly because, in essence, Odin’s tale is one of Death and Ressurrection...fully in keeping with the Christian message. 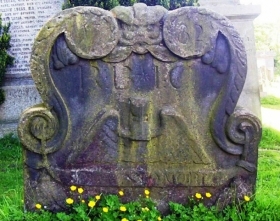 Often one side of a stone will show the Green Man, and the other an Angel. Pagan and Christian side-by-side. 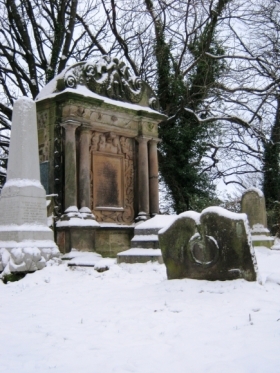 Others will show the tools of a man’s trade – a blacksmith’s anvil, a scrivener’s (writer’s) quill or a gardener’s spade, for example – so that long after their names are forgotten and their remains rlotted away we might remember and honour their role in the life of the town. Many show the ‘Reverse-4’ sigil of the Merchant’s Guild, or the indicia of the Incorporated Trades – marks of rank and status. Take time to wander through the graveyards...for they are as much a celebration of life as they are of the inevitability of death.